Semester 1 2015 – How was it for you? We extended 24/7 opening which means the University Library was open 2,556 hours from September to the end of term, that’s a whopping 56% increase from last year. 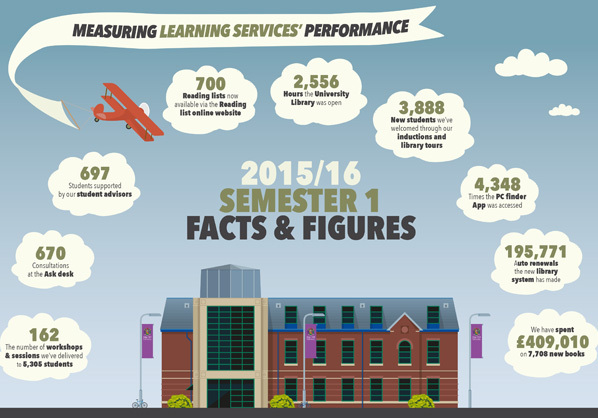 Our focus in the early part of term is very much about new students and skills sessions and this year we welcomed 3,888 new students at inductions and library tours and also delivered 162 workshops to 5,305 students. We know accessing resources is very important to our students and this year, so far, we have spent £409,010 on 7,708 new books and to improve access to your module reading lists, there are now over 700 reading lists available via our new service ‘Reading Lists Online’. Our student advisors are based at the Ask desk but you will also see them roving out and about in the library, departments and the HUB – they helped 697 students during the first term which is excellent news. The Ask desk team provide 1-2-1 help at the desk – this can be anything from help with Harvard Referencing to finding out which are the best databases for your subject, and in term 1 there were 670 consultations. The new fairer fines approach is certainly having an impact – the system made 195,771 auto-renewals which is saving you both money and time! And finally, just as important as finding resources is finding a PC. The Web Team provide a really useful tool – PC Finder App – which was accessed 4,348 times during our busy first term. We recently had the good news around an additional 22 PCs for the University Library and those PCs will become part of the map of available PCs. Using statistics is just one of the ways we measure our performance, we have also undertaken impact and evaluation studies of our induction offer, Uni Skills workshops we held in term 1 and also 1-2-1 support for both study skills and SpLD support. Hearing the student voice and finding out if the support is making a difference is key to improving our services. We will be reporting some of those findings in the coming months.